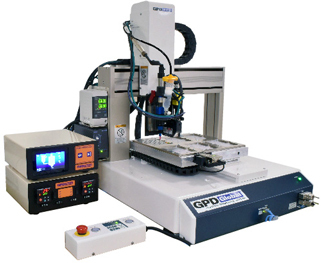 GRAND JUNCTION, CO USA ― September 2018 ― GPD Global, manufacturer of high quality precision fluid dispensing systems, conformal coating, and component prep systems offers the ideal tabletop robots (Catalina Series) for precision dispensing. A tabletop system does not mean “no features” - on the contrary, Catalina, the simple and efficient dispense robot, provides you with standard features such as automatic vision, laser surface sensing, nozzle alignment, and calibration. A tilt and rotate model is also available to meet your production needs. The Catalina benchtop series can be configured with an optional heated work area. Catalina tabletop robot was developed for precision dispensing with a budget in mind. Enjoy greater precision, more productivity, and higher repeatability for your dispensing jobs! Catalina, the compact dispense robot, is easy to learn with its computer-based software and Windows operating system. It uses easy point based teaching for all axis movement with the ability to set point jobs and various parameters. Check out the tilt and rotate model. Applications using solder pastes, glues, encapsulants, gasketing, underfills, conductive adhesives, and more benefit from a Catalina tabletop dispensing system. Programming is done using a computer. User-friendly graphic editing allows users to effortlessly create a dispense path. For complex path programming, AutoCAD DXF files can be imported. For uneven surfaces, the system can use the laser to trace a dispense path for automatic dispense height adjustment. Catalina benchtop dispense robot systems are compatible with GPD Global’s full line of dispensing pumps: Precision Auger, NCM5000 Jetting, Volumetric Progressive Cavity Displacement (PCD), and Time Pressure. A pump is available to suit your application and dispense requirements. GPD Global is an equipment manufacturer of high quality, precision, automated fluid dispensing, conformal coating, and component-prep systems. The company is an international, state-of-the-art equipment supplier for the PCB assembly and semiconductor industries. We design and manufacture a wide variety of Automatic Fluid Dispensing and Conformal Coating Systems. We also manufacture SMT Cover Tape Peel Tester and Component Prep equipment for Thru-Hole applications.